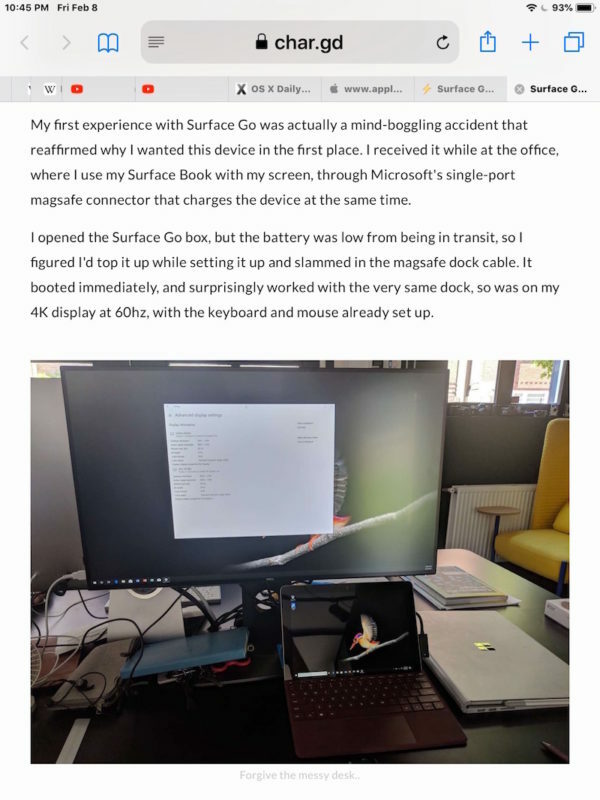 Have you ever been reading an article in Safari on an iPhone and wished you could be reading the same article on your larger screened iPad instead? Rather than email or message yourself the article link, this is a perfect situation to use the wonderful Handoff feature for. Handoff allows you to quite literally hand an app session from one device to another, and Handoff works with MacOS and iOS devices. 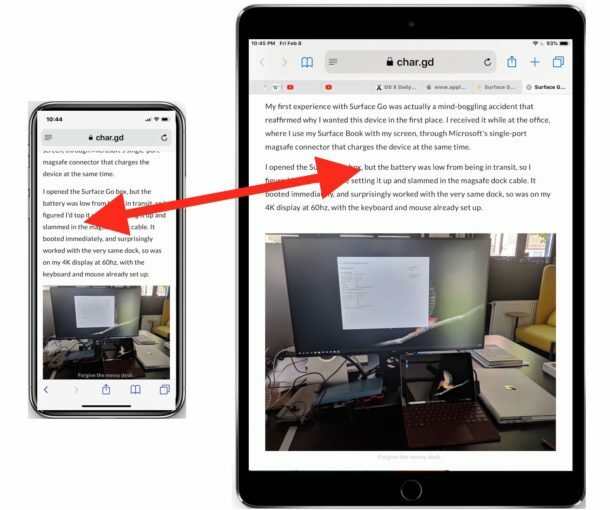 For our purposes here, we’ll be showing you how to use Handoff to pass a webpage from Safari on an iPhone to an iPad, but it works the exact same going the other direction too. Requirements: To use Handoff, you will need two modern iOS devices running a somewhat modern iOS release, and they must be using the same Apple ID with iCloud. The devices must be in close proximity to one another, and on the same internet connection. Of course Handoff must be enabled too, which you can check by going to Settings > General > Handoff and confirming it is toggled to the ON position. It’s as simple as that! Now you’re reading the webpage or article on the larger screened iPad (or other iOS device). If you want to try this out yourself, you can use this very article you’re reading right now. Just pick up your iPhone and iPad and follow the steps above. This obviously covers passing Safari webpages from iOS to iOS, but you can pass them from Mac to iOS and iOS to Mac as well, as long as Handoff is also enabled on the Mac and it’s using the same Apple ID too. 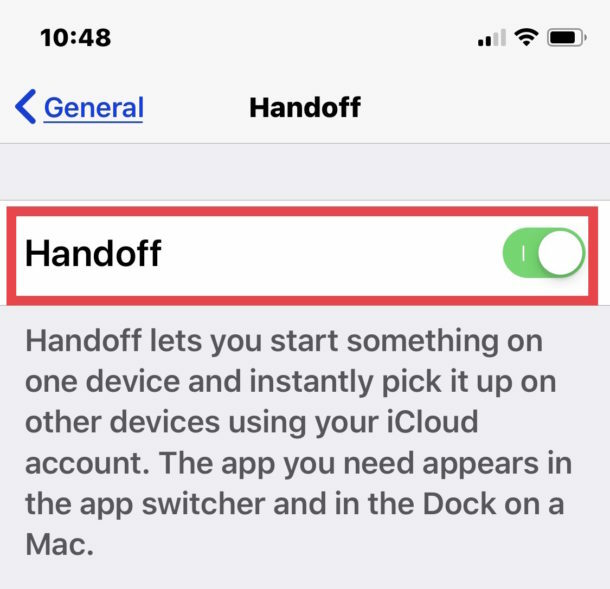 You can learn more about using Handoff in MacOS and iOS here if interested, the feature exists for many other apps and is not limited to Safari. Another option for passing a browsing session from one iOS device to another iOS device (or Mac) is to use Universal Clipboard feature, which allows you to copy something on one of your devices and paste it onto another. Universal Clipboard is another Handoff / Continuity feature, and it works great as well. Also be sure that iCloud is signed in with the same Apple ID on all devices involved. In terms of version and device support, most new iPhone and iPad models will have this feature as it was originally introduced way back in the 8.1 release of iOS, so any modern iPhone or iPad that is kept somewhat up to date with iOS 12 or later will certainly include the Continuity and Handoff features. With OS High Sierra (and earlier vs. ?) Handoff is unreliable and buggy. Often on the iPad I need to write the url’s first characters, then Safari ‘gets it’ and I can open the page. So the Handoff information (the url) is there (somewhere), but often there is a timeout. I have been using iPhone and Mac from the day they were launched. But somehow certain things don’t work for me. I can’t use HandOff feature, Universal Clipboard doesn’t work for me, iMessage on Mac doesn’t work for me. God Knows why.. I have restores my iPhone as new a couple of times. Restored my Mac as new as well. Logged out and then logged back in to iCloud on both the device to make sure they sync. But nothing helped. If you know how to get it working, let me know. Jignesh, I have had these issues you describe several times myself. 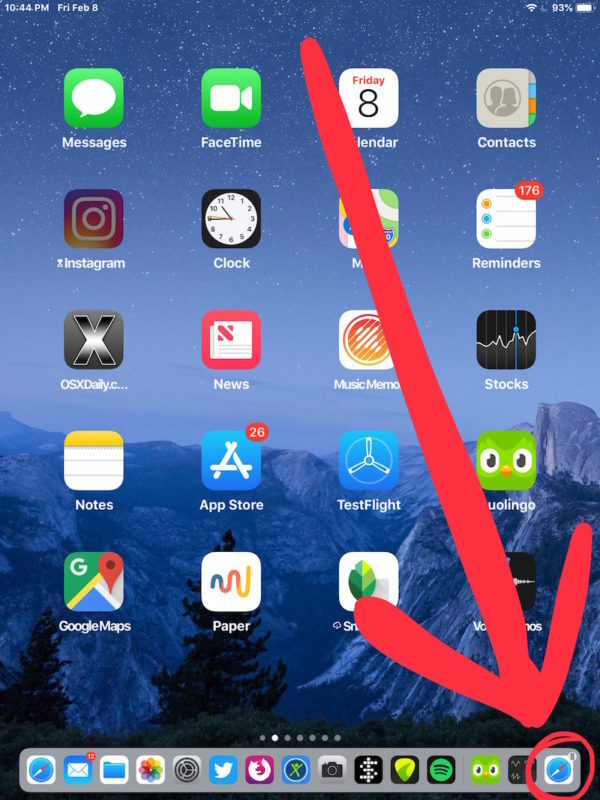 How I can reliably get Handoff features working is by having iOS and MacOS on the latest versions available, using the same iCloud account, both with Bluetooth enabled, and on the same wi-fi network, and both devices in close proximity to each other. Unfortunately with different iOS versions on different devices, or an old MacOS and newer iOS, I often have problems as well. It is finicky, which can be frustrating. Anyway, if you find that works, or you find another solution to your issue, please share it! I think these are commonly experienced problems with a lot of Apple users. This is a simple and very efficient feature. Although I don’t think being on the same network is a must. I’m reading this from a cafe and my Mac is connected to cafe’s WiFi but not my iPhone and I can use Handoff. As far as I know only bluetooth is required to determine proximity between two devices.